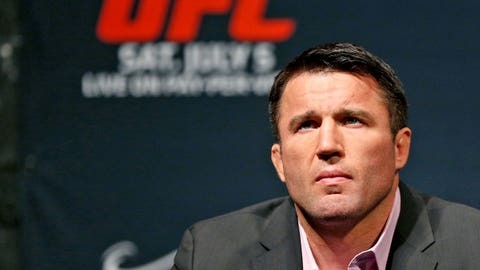 Chael Sonnen retired after learning he failed a drug test earlier this month. Now, he has failed another. SAN ANTONIO — Chael Sonnen is going to have plenty more to talk about with the Nevada Athletic Commission. The UFC star retired abruptly earlier this month on the heels of learning that he failed a drug test and would not be allowed to fight at UFC 175 on July 5 in Las Vegas. Now, it has come out that has Sonnen failed a second test, testing positive for human growth hormone (HGH) and recombinant human erythroprotein (EPO), the UFC confirmed Saturday after UFC Fight Night at AT&T Center. MMA Fighting was the first to report the NAC’s test results. On June 10, it was announced that Sonnen had failed an initial drug test administered by the NAC on May 24 while Sonnen was in Las Vegas for UFC 173. Sonnen had traces of banned substances anastrozole and clomiphene in his system. I will cooperate with the Commission and look forward to having a dialogue about how fighters who transition off TRT can avoid violating any rules. The NAC asked Sonnen to take another test June 5 in Portland, Ore., as part of the state’s ramped-up drug-testing policy, according to MMA Fighting. The commission learned earlier this week that Sonnen had failed due to the presence of HGH, EPO (typically used to boost red blood cells that carry oxygen to muscles), anastrozole (used to treat early stages of breast cancer) and human chorionic gonadotropin (hCG), a female fertility drug used in an effort to kick start natural testosterone production. "Yes, the Commission is aware of other prescribed medications I was taking and I will not challenge their allegations. I will cooperate with the Commission and look forward to having a dialogue about how fighters who transition off TRT can avoid violating any rules." Sonnen was given a temporary suspension by the NAC on June 17 with a full verdict to come soon. That was before the results came back from the second test. NAC chairman Francisco Aguilar told MMA Fighting that Sonnen’s case has been amended to include the new information. He will be on the agenda at the next meeting, scheduled for July 23 in Las Vegas. "Our stance on the subject remains absolutely the same," said Dave Sholler, the UFC’s senior director of communications, on Saturday after UFC Fight Night. "We support the commission and we will continue to ensure all UFC competitors compete on an even playing field, free of performance-enhancing drugs and banned substances." Sonnen was initially supposed to fight Wanderlei Silva at UFC 175, but Silva evaded his own drug test. Vitor Belfort stepped in, but he is also coming off TRT and has yet to be cleared by the NAC.